This document is provided by the Agency for Toxic Substances and Disease Registry (ATSDR) ONLY as an historical reference for the public health community. It is no longer being maintained and the data it contains may no longer be current and/or accurate. How does air pollution affect me? All around the earth there is a thick blanket of air called the atmosphere. Air, like other gases, does not have a fixed shape. It spreads out to fill any available space so nothing is really empty. But air cannot escape from the atmosphere as the force of gravity keeps it from floating away from the earth. Ever since people first gathered in settlements there has been pollution. Pollution usually refers to the presence of substances that are either present in the environment where it doesn't belong or at levels greater than it should be. 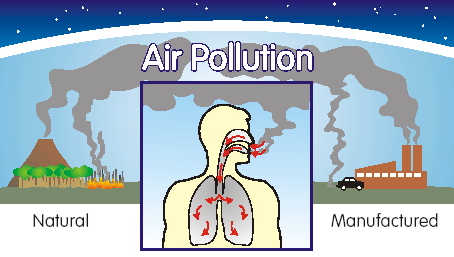 Air pollution is caused by any undesirable substance, which enters the atmosphere. Air pollution is a major problem in modern society. Even though air pollution is usually a greater problem in cities, pollutants contaminate air everywhere. These substances include various gases and tiny particles, or particulates that can harm human health and damage the environment. They may be gases, liquids, or solids. Many pollutants are given off into the air as a result of human behavior. Pollution occurs on different levels: personal, national, and global. Some pollutants come from natural sources. Ultra-fine dust particles created by soil erosion when water and weather loosen layers of soil, increase airborne particulate levels. Volcanoes spew out sulfur dioxide and large amounts of pulverized lava rock known as volcanic ash. Gaseous pollutants: A different mix of vapors and gaseous air pollutants is found in outdoor and indoor environments. The most common gaseous pollutants are carbon dioxide, carbon monoxide, hydrocarbons, nitrogen oxides, sulfur oxides and ozone. A number of sources produce these chemical compounds but the major man-made source is the burning of fossil fuel. Indoor air pollution is caused by cigarette smoking, the use of certain construction materials, cleaning products, and home furnishings. Outdoor gaseous pollutants come from volcanoes, fires, and industry, and in some areas may be substantial. The most commonly recognized type of air pollution is smog. Smog generally refers to a condition caused by the action of sunlight on exhaust gases from motor vehicles and factories. The Greenhouse effect prevents the sun's heat from rising out of the atmosphere and flowing back into space. This warms the earth's surface causing the green house effect. While a certain amount of green house gases in the atmosphere are necessary to make the earth warm, activities such as the burning of fossil fuels are creating a gaseous layer that is too dense to allow the heat to escape. Many scientists believe this is causing global warming. Other gases contributing to the problem include cholrofluorocarbons (CFC), methane, nitrous oxides, and ozone. Acid rain forms when moisture in the air interacts with nitrogen oxide and sulfur dioxide released by factories, power plants, and motor vehicles that burn coal or oil. This interaction of gases with water vapor forms sulfuric acid and nitric acids. Eventually these chemicals fall to earth as precipitation, or acid rain. Acid rain pollutants may travel long distances, with winds carrying them thousands of miles before they fall as dew, drizzle, fog, snow or rain. Damage to the ozone layer is primarily caused by the use of chloroflurocarbons (CFCs). Ozone is a form of oxygen found in the earth's upper atmosphere. The thin layer of ozone molecules in the atmosphere absorb some of the sun's ultraviolet (UV) rays before it reaches the earth's surface, making life on earth possible. The depletion of ozone is causing higher levels of UV radiation on earth, endangering both plants and animals. Particulate matter is the general term used for a mixture of solid particles and liquid droplets found in the air. Some particles are large or dark enough to be seen as soot or smoke. Others are so small they can be detected only with an electron microscope. When particulate matter is breathed in, it can irritate and damage the lungs causing breathing problems. Fine particles are easily inhaled deeply into the lungs where they can be absorbed into the blood stream or remain embedded for long periods of time. Climatic effects: Normally pollutants rise or flow away from their sources without building up to unsafe levels. Wind patterns, clouds, rain, and temperature can affect how quickly pollutants move away from an area. Weather patterns that can trap air pollution in valleys or move it across the globe may be able to damage pristine environments far from the original sources. The Air Quality Index is a tool used by EPA and other agencies to provide the public with timely and easy-to-understand information on local air quality and whether air pollution levels pose a health concern. The AQI tells the public how clean the air is and whether or not they should be concerned for their health. The AQI is focused on health effects that can happen within a few hours or days after breathing polluted air. touching contaminated soil, dust or water. For more information about how air pollution affects your health, visit http://www.cdc.gov/nceh/airpollution/. For more information about specific air pollutants, contact your local EPA office or go to their Web site at www.epa.gov .